« Mood lighting – how to transform your venue! We are excited to launch our newest addition to our hire catalogue – ruched chair covers! Make Believe Events are no longer spring chickens when it comes to the events industry (though with age comes experience and wisdom!) and having done chair covers for 7 years now we are always looking for ‘something new’ to add to our stock. We have been on board with many trends in recent years for sash types – the change to lace, hoods and specialised ties. Now it is time for a new style of chair cover and we have decided to now stock ruched chair covers! 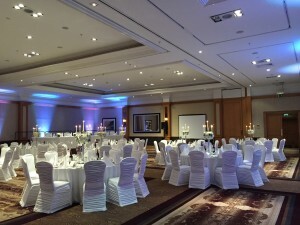 Why choose ruched chair covers? There a number of reason why these chair covers are a great choice! – They are new – it is important when planning an event to stay fresh with design ideas and ruched chair covers offer a great alternative to plain chair covers and your guests will notice this and the be impressed with the attention to detail shown in using this new style. It is hard to get an event that stands out to the next, but these covers will certainly do that! – They are cost effective – yes they are more expensive than a standard chair cover but you do not need a sash with ruched chair covers and this means overall, per chair, this is a cheaper option. – They are flexible – with the stretch material they can fit a variety of chairs from standard banqueting chairs at traditional hotel venues to bespoke chairs at boutique venues. This is a catch all option! – Ruched chair covers look elegant, refined and luxurious. Do you need any other reason than they look FAB?!? For more examples of events showing our ruched chair covers visit our Facebook page. There are lots of different chair cover options out there and you can view these and our ruched chair covers on our website. We are always here to advise so please get in touch for advice!